Listening to podcasts over the last two months has helped me improve this blog, our social media marketing and almost every aspect of my online business. From the improvement of our VIP List, gaining more subscribers, tweaking SEO, adding important pages, finding and writing more authoritative content… and on and on. Listening to podcasts has me more excited and motivated than I’ve been since I can remember. I can’t tell you how many times I’ve spent hour after hour of driving while listening to NPR or other radio stations just hoping to hear a little something about Google, Facebook or social media. How cool would it be to have a radio show dedicated to blogging? Well, with today’s technology, there’s almost an endless supply of audio content to consume when on the go and I can’t begin to tell you how excited I am to finally take full advantage of podcasts. Each month I set a 30 day challenge for myself and last month (August 2013) my 30 day challenge was to listen to every one of Pat Flynn’s Smart Passive Income Podcasts. That was 77 different episodes and many of them as long as an hour or more. This was by far one of my favorite challenges to date because I learned an incredible amount of great blogging and social media information that I’ve been able to put to use. I’ve listened to many podcasts in the past but that challenge last month really turned me into a podcast listening addict. I’ve moved onto over a dozen podcasts that I now listen to regularly. A lot of us think of podcasts as synonymous to iTunes. That’s not true, not at all. Android Users Can Still Listen To Podcasts. I use an Android Smartphone and a Nook HD+ Tablet which runs on the Android platform. So I do have access to iTunes on my desktop or laptop but it’s difficult on my mobile devices. IOS apps (iPhone apps) can’t run on Android but there are alternatives. Stitcher is the one I went with but now I’ve found an even better alternative. Stitcher works well with just listening to a podcast while on the go but user control isn’t all that great and you need a solid connection to listen. Pocket Casts allows my to actually pick and download the podcast to my device and the controls are much more user friendly. Now if i’m in an area where there’s no cell service or a weak signal, I’m still in business. The Pocket Casts app is cross-platform and it’s much more than a player, it’s a way to manage your podcasts. We, hopefully, consume content on a daily basis. We read other blogs, watch the news, listen to the radio and watch videos. Take blogging for example; bloggers from every niche might read blog posts on blogging, social media and online business, right? Sure, they want to improve their blogs and online business but which logs should they read? Mine of course. LOL Seriously though, how many blog posts have been written on how important it is to write great and original content? Crazy, right? So we find the blogs that we can relate with and get the most from and become regular readers. Now, some of the really great things we want to learn are tough to access because that value often comes with a pricetag. Bloggers and marketers recognize the profit potential and use just enough content to hook us into buying an eBook, a paid webinar, an e-course, live event, or membership. There’s nothing wrong with that and that’s often the best money you’ll ever spend. Many podcasts are loaded with interviews with very popular experts in a variety of topics. I hear many podcasters asking the same questions I want to ask myself and that’s because they, as the interviewer, can relate to you, the listener, better than a news reporter just trying to get the facts, as an example. Having real experts pouring they’re heart out in a podcast environment just seems like the perfect fit. I couldn’t possibly tell you what podcasts are best for you any more than I could tell you which blogs to read. I will give to a few of my favorites and that might help you get started but it’s very easy to find the perfect podcasts for your situation. Podcasts, just like other forms of media consumption, can be used to, basically, do three things. Entertain, educate or inspire. The best podcasts, just like video, will accomplish all three. There are podcasts on almost any topic. I just search Stitcher for “knitting” and there are actually podcasts dedicated to knitting. Most news stations and radio shows now have podcasts. Search for podcasts within your niche and take advantage of that information. 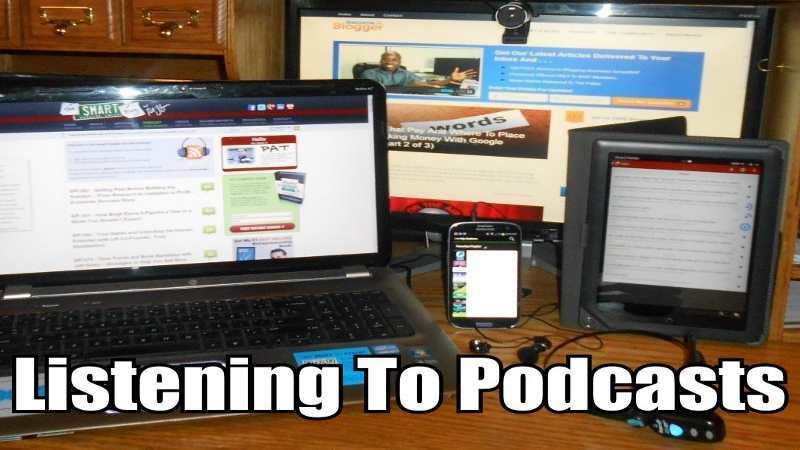 Most podcasts are associated with websites. Many bloggers will setup a dedicated post for each podcast episode. These posts generally have the show notes that will include links and key points mentioned in that show. This is a great way to follow-up on what you’ve learned without writing notes as you’re driving your car, riding your bike or running laps in the gym. All you have to know is the blog post URL. I hope this post inspires some of you to listen to podcasts but, truthfully, it means nothing if you don’t act on what you’ve learned from those podcasts. So please, if you’re not already actively listening to podcasts, give it a try. This post was inspired by Leslie Samuel and I can’t think of a better podcast to get you started then How To Take Full Advantage Of Podcasts. Thank You Leslie Samuel, you are truly an inspiration! I’d love to know what podcasts you are listening to or what tools you use. Do you have any advice for e or the other readers? I live for your comments so feel free to comment below via WordPress, Facebook or Google Plus, just click the appropriate tab.